I read Winter Journey back in 2006, but I didn’t remember this when I picked up the audio book at the library. Listening to it rather than reading it made it seem fresh and unfamiliar – partly because the narrator, Deidre Rubinstein, has performed the text rather than narrated it, and partly because the characters’ names, pronounced properly in Polish, seemed entirely new to me. It’s the story of Polish-born Halina Shore, a forensic dentist, who – discontented with an unsatisfactory affair with a married man, and rootless since her mother’s death – takes off for Poland, to assist with the United Nations exhumation of a mass grave at Novacalvaria (New Calvary). It is no secret that the grave is there, nor that it holds the remains of about 1000 Jews who were burned alive in a barn in July 1941 – what is at stake is the identification of the perpetrators. Halina’s escape from the emptiness of her life in Australia (where she has lived since childhood) results in a journey of self-discovery which would spoil the story to reveal here. As mysteries and secrets are gradually revealed, Halina learns that butchery and heroism can exist side-by-side and that antiSemitism is still a powerful force when beneficiaries of pogroms fear that justice may finally catch up with them. It’s not just that Poland (hoping for admission to the European Union) may have to pay compensation for Jewish homes and land that were appropriated in the wake of the atrocity, it’s also that the villagers do not wish to confront an unpalatable truth about themselves. Their sense of Polish identity is affronted by the investigation too. There are elements in the story which draw parallels with Aboriginal dispossession. The author’s stance (written in the period when John Howard refused to make a healing Apology to the Stolen Generations) seems to be that the truth should be told, but that while later generations should acknowledge what happened and say sorry for it, they should feel no personal guilt. Halina’s relationships in Poland symbolise the way victim and perpetrator do not need to carry the hatred on into future generations. Despite the horror of events as they are revealed, Winter Journey is a hopeful story which promotes truth, justice and reconciliation. 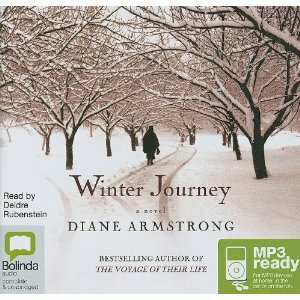 Published by Harper Collins in 2004, Winter Journey was Diane Armstrong’s first novel, and was shortlisted for the Commonwealth Writers’ Prize. For more information about the author and her other books, see her website. Hi Tom, I think you can download it from audible.com – though audio books are expensive. (The Book Depository has it for $108 AUD, though it seems to be not just the CD because the picture shows headphones too.) I’ve only ever bought three audio books because of the cost so I’m lucky that both my libraries have quite good collections of audio books! I was interested in your comment about Rubenstein “performing” this book. That was my problem with her “reading” of “Swords and Crowns and Rings” (and how great that you had that comment from Park’s grandson the other day!!). It took us quite a few discs to get used to what we felt was over-dramatisation. As pretty much audiobook virgins, we wondered if they were all like that. Still, this books sounds interesting … I’m not sure I’ll ever get to it, but if it crosses my path I would be happy to read/hear it. I was really chuffed about Tom’s response to my post about ‘Swords and Crowns and Rings’ – and it’s so nice to think that she is still with us and that her family are carrying on the literary tradition with another book in the offing. Kilmeny Niland was *such* a fine illustrator, her death really is a loss. You know, I suspect that the audio book is better as a solitary pleasure, company for dreary drives when one is alone. I’ve never succeeded with one when The Spouse is in the car, perhaps because there is an impulse to be sociable with one’s passengers, and talk through it? There were a couple of times when I thought Rubinstein’s performance was over-the-top, but then on reflection, in this book she was narrating extreme circumstances for which British emotional restraint really isn’t appropriate…there are indeed times when a passionate response is called for. Your review made me think of a film called Katyn that explores the fate of Polish Army officers captured by the Red Army. The Polish president was to attend a Katyn memorial service when his plane crashed. Anyway Katyn is a 2007 Polish film, and it is excellent in its portrayal of both Nazi and Soviet propaganda and the attempts of these two opposing forces to dump the crime on each other while silencing the families of the victims. That sounds like an interesting film – and you know, I don’t think I’ve ever seen a Polish film. I’ve added it to my Q at BigPond Movies. I’m hesitant over what you called her “performing” the book, but the story does sound interesting, so maybe I should read it instead of listening to it? Oh, Iris, I hope I haven’t put people off the audio book! It actually works well, because there is quite a large cast of characters and the different voices helps to keep track of them all when you’re listening to it. And some are particularly well done: the priest’s old housekeeper who reluctantly breaks her silence is unforgettable. Your problem might be finding a copy of the book – the CD version has only just been released but the book is hard to find. Readings seems to have a copy or failing that try http://www.worldcat.org/ to see if it’s in a library near you.